Gabrielle Tinto is a native of Syracuse, New York, where she began her vocal studies with renowned soprano Helen Boatwright. Ms. Tinto received her B.M. in Vocal Performance from Northwestern University and her Master of Music degree from the University of Miami. A versatile vocalist, Ms. Tinto has performed a wide range of music including Baroque oratorio, French cabaret, comedic operetta, and contemporary art song. Recent solo engagements have included J.S. Bach’s St. John Passion and Mozart’s Requiem. 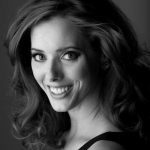 An active ensemble singer, Gabrielle has performed across the country with Seraphic Fire, Spire, True Concord, Bach Collegium San Diego and the Santa Fe Desert Chorale. Gabrielle has appeared on several Grammy nominated albums.